Die Veneris, 1 Maii, 16 Regni Regis Car. ORDERED, upon the Motion of Mr. Corbett, a Member of this House, That the Proceedings in the Court of Wards, betwixt Mr. Jo. Tooly, a Member of this House, Defendant, and Tho. Wormall, Gent. Plaintiff, in the Court of Wards, shall be stayed. Ordered, That the receiving the Communion on Sunday next shall be put off, till it be further declared by the House, after the Time for the Fast shall be settled. The Clerk to peruse the Notes; and where any Man is set down, and no County, City, or Borough, mentioned, for which he serves, there those to be added to his Name. 2a vice lecta, An Act touching Needle-makers and Steel Wire-drawers; upon the Question, committed to the Knights and Citizens of London, Mr. Jo. Rolles, Sir Anth. Ereby, Sir Jo. Jacob, Sir Jo. Wolstenholme, Mr. Hooke, Mr. Corbett, Mr. Cage, Mr. Harrison, Mr. Waddon, Alderman Atkins, Mr. Singleton, Sir Nich. Cripps, Sir Arth. Ingram, Mr. Edw. Hide, Sir Wm. Powell, Mr. Waindsford, Mr. Charles Price; to meet this Afternoon, at Two of Clock, in the Exchequer Chamber. Ordered, The Committee for Trade to be a Committee of the whole House; and to sit in the House at the Days formerly appointed; and to have the like Power that the former Committee had. Ordered, Her former Petition to be re-delivered, to be amended; and such Counsel assigned, as is desired in her Petition. The Petition of Sir Peter Vanlooe read, and Ordered according to the Desire therein expressed: The Hearing to be at the Committee for Courts of Justice, at such time as they shall think fit: And Mr. Pilson to be excused from being of his Counsel. The Petition of Jo. Tyng and Thomas Poole read, and referred to the Committee for Grievances. Ordered, The Committee concerning the Bill of Common Recoveries, to be suffered by Infants, to sit in the Star Chamber, on Monday next at Two of Clock in the Afternoon; and Mr. Pelham to take care of the Bill. Ordered, Neither of the Two Burgesses returned upon the last Writ for Aylsborough, to sit in the House, till the House shall further order it. Sir Beauchamp St. John returned in both; and therefore to sit. Ordered, Mr. Butler, and Sir Sam. Luke, to forbear to sit, till their Controversy be decided. 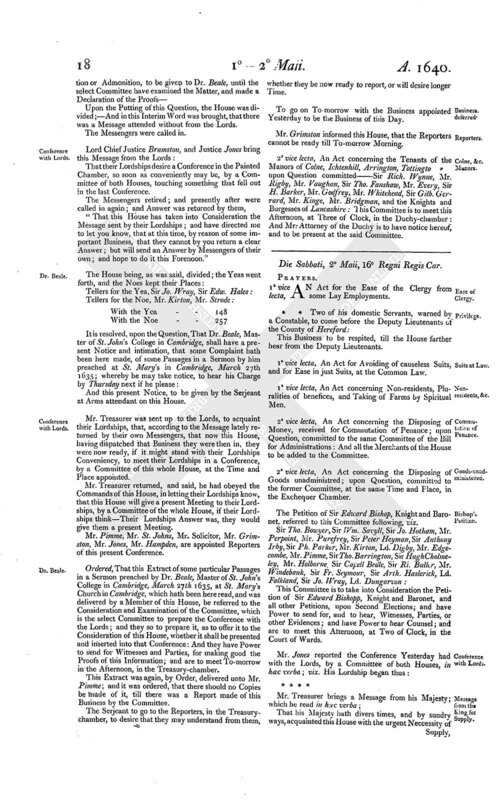 Ordered, The Committee for Privileges make a Sub- committee, to consider of the double Returns, and to view the Indentures, and to report the same immediately to the House. 2a vice lecta, An Act for Reformation of divers Abuses in Ecclesiastical Courts; upon Question, committed unto Mr. King, Dr. Eden, Mr. Jones, Sir Tho. Withrington, Mr. Peard, Sir Ra. Hopton, Mr. Pellham, Dr. Jones, Sir Tho. Barrington, Mr. Glinne, Mr. Godfrey, Mr. Ra. Goodwin, Mr. Rigby, Mr. Rolles, Sir Jo. Strangewayes, Sir Wm. Masham, Sir Peter Heyman, Dr. Parry, Dr. Farmory, Mr. Corbett, Mr. Nath. Fines, Sir H. Mildmay, Mr. Ch. Price, Ld. Falkland, Mr. Rowse: This Committee is to meet this Afternoon, at Two of Clock, in the Court of Wards.-Mr. Fines had this Bill. 2a vice lecta, An Act concerning the Granting of Administrations; upon the Question, committed unto Mr. Comptroller, Mr. Waindsford, Sir Ro. Crane, Mr. Hatcher, Mr. Moore, Sir Rob. Harley, Mr. Kirton, Sir Tho. Bowyer, Mr. Baldwin, Mr. Owen, Mr. Rolles, Sir Wm. 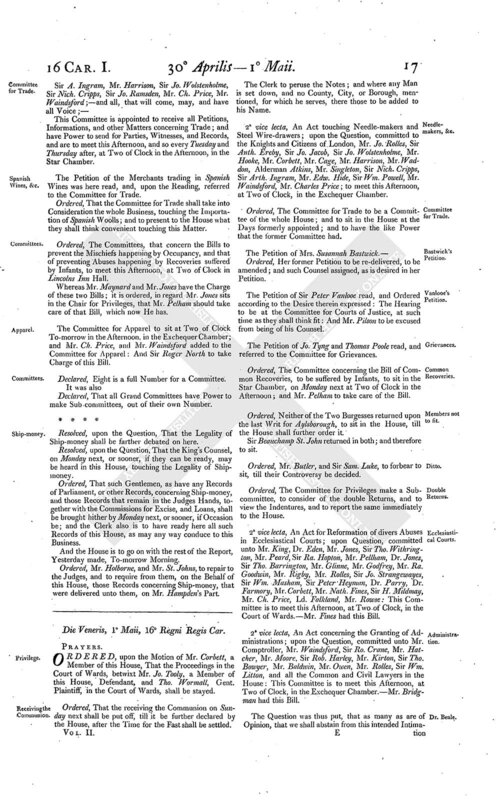 Litton, and all the Common and Civil Lawyers in the House: This Committee is to meet this Afternoon, at Two of Clock, in the Exchequer Chamber.-Mr. Bridgman had this Bill. Upon the Putting of this Question, the House was divided;-And in this Interim Word was brought, that there was a Message attended without from the Lords. The Messengers were called in. That their Lordships desire a Conference in the Painted Chamber, so soon as conveniently may be, by a Committee of both Houses, touching something that fell out in the last Conference. "That this House has taken into Consideration the Message sent by their Lordships; and have directed me to let you know, that at this time, by reason of some important Business, that they cannot by you return a clear Answer; but will send an Answer by Messengers of their own; and hope to do it this Forenoon." And this present Notice, to be given by the Serjeant at Arms attendant on this House. Mr. Treasurer was sent up to the Lords, to acquaint their Lordships, that, according to the Message lately returned by their own Messengers, that now this House, having dispatched that Business they were then in, they were now ready, if it might stand with their Lordships Conveniency, to meet their Lordships in a Conference, by a Committee of this whole House, at the Time and Place appointed. Mr. Treasurer returned, and said, he had obeyed the Commands of this House, in letting their Lordships know, that this House will give a present Meeting to their Lordships, by a Committee of the whole House, if their Lordships think- Their Lordships Answer was, they would give them a present Meeting. Mr. Pimme, Mr. St. Johns, Mr. Solicitor, Mr. Grimston, Mr. Jones, Mr. Hampden, are appointed Reporters of this present Conference. Ordered, That this Extract of some particular Passages in a Sermon preached by Dr. Beale, Master of St. John's College in Cambridge, March 27th 1635, at St. Mary's Church in Cambridge, which hath been here read, and was delivered by a Member of this House, be referred to the Consideration and Examination of the Committee, which is the select Committee to prepare the Conference with the Lords; and they so to prepare it, as to offer it to the Consideration of this House, whether it shall be presented and inserted into that Conference: And they have Power to send for Witnesses and Parties, for making good the Proofs of this Information; and are to meet To-morrow in the Afternoon, in the Treasury- chamber. This Extract was again, by Order, delivered unto Mr. Pimme; and it was ordered, that there should no Copies be made of it, till there was a Report made of this Business by the Committee. The Serjeant to go to the Reporters, in the Treasurychamber, to desire that they may understand from them, whether they be now ready to report, or will desire longer Time. To go on To-morrow with the Business appointed Yesterday to be the Business of this Day. Mr. Grimston informed this House, that the Reporters cannot be ready till To-morrow Morning. 2a vice lecta, An Act concerning the Tenants of the Manors of Colne, Ichtenhill, Arrington, Tottingto * upon Question committed- Sir Rich. Wynne, Mr. Rigby, Mr. Vaughan, Sir Tho. Fanshaw, Mr. Every, Sir H. Barker, Mr. Godfrey, Mr. Whitehead, Sir Gilb. Gerrard, Mr. Kinge, Mr. Bridgman, and the Knights and Burgesses of Lancashire: This Committee is to meet this Afternoon, at Three of Clock, in the Duchy-chamber: And Mr. Attorney of the Duchy is to have notice hereof, and to be present at the said Committee.